More than three years still remained in George W. Bush’s presidency when it had already collapsed by the end of 2005. The Bush revisionism industry has thus enjoyed an unusually long period of time in which to plan out its action and predict their man’s comeback as a misunderstood, unduly maligned and — dare they say it? — successful president. 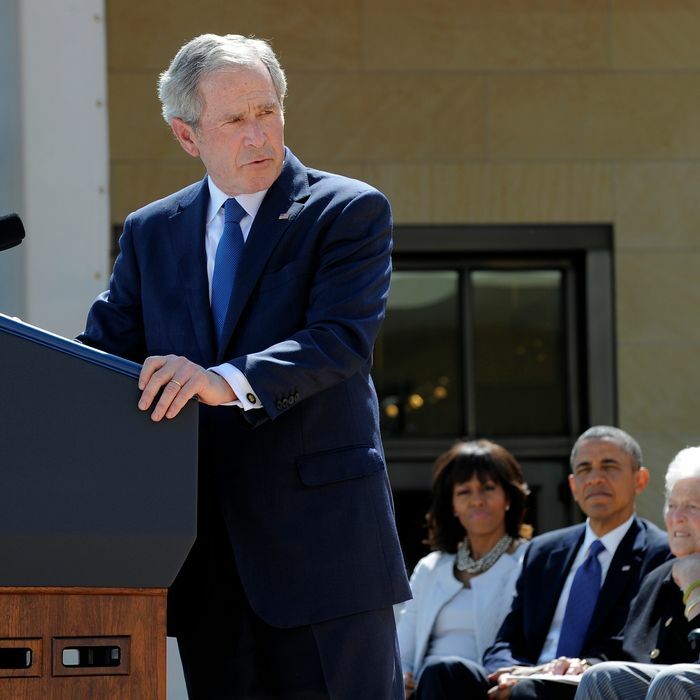 The opening of the Bush museum today has opened up a flood of pent-up Bush revisionism. It is also true that Bush’s party unfortunately decided, after his presidency, that he failed primarily by being too moderate, too compassionate, and too bipartisan, and moved even further right since, making Bush look retrospectively sane. At the time, some of us simply took for granted Bush’s choices to avoid anti-Muslim bigotry and not propose enormous cuts to government programs for the sickest and most vulnerable Americans. By the standards of the present-day GOP, these decisions make Bush look fair-minded and even statesmanlike. But the Bush revisionist project has far more ambitious aims than to merely salvage a few specks of decency from the ruins. It aims for a wholesale restoration, both characterologically and substantively. I suppose all this hinges on what we mean by “pretty smart.” How smart do you have to be to become a governor, or to make it onto a presidential ticket? That’s just one step away from becoming president, but I wouldn’t call Sarah Palin “pretty smart,” at least not by the standards that ought to apply to a job like president. If you’re talking about a bunch of people you knew from high school, then sure, maybe you’d say Bush or Palin were pretty smart. If you like and sympathize with Bush’s program, you might find some deeper intelligence there. I see only evidence of a man who not only lacks the ability to think analytically but disdains the very notion of it. One defense of Bush, offered by less sycophantic figures like David Brooks, is that the man on public display is a far dumber version of the real thing. This is fairly hard to believe, but it is also at odds with a fair amount of indirect evidence. One congressman – the Hungarian-born Tom Lantos, a Democrat from California and the only Holocaust survivor in Congress – mentioned that the Scandinavian countries were viewed more positively. Lantos went on to describe for the president how the Swedish Army might be an ideal candidate to anchor a small peacekeeping force on the West Bank and the Gaza Strip. Sweden has a well-trained force of about 25,000. The president looked at him appraisingly, several people in the room recall. When Bush first appeared on the political scene, and especially during the apparently successful first couple of years of his presidency, his defenders swatted away questions about his mental acuity by pointing to his success. If he’s so dumb, how has he achieved so much? Well, he didn’t. He oversaw a disastrous administration for precisely the reason his critics always grasped: Bush was an intellectual simpleton, a man who made up his mind in absence of the facts, who swatted away inconvenient realities as annoyances. So the main question hanging over Bush is his record itself. The most useful defense of the Bush record is probably Jennifer Rubin’s — useful because it is so slavish and so crude it inadvertently exposes all the catastrophic weaknesses in the Bush record that more clever defenders have usually learned to tiptoe around. Rubin begins by citing rising approval ratings for Bush in his absence from office from which she infers, “Bush, like so many other presidents, can be judged best with the passage of time.” Actually, a basic rule of public opinion is that removing oneself from partisan controversy is a nearly foolproof way to enjoy high approval ratings. That’s why first ladies (at least when they stay out of politics) enjoy high approval ratings. It’s why Jimmy Carter has seen his approval rating soar up into the mid-60s. Unless Rubin wants to defend the proposition that Carter, too, is properly viewed more accurately with the passage of time. Rubin praises Bush for enacting the “fiscally sober” Medicare prescription drug benefit, unlike the “exorbitant program like Obamacare.” She seems genuinely unaware that Bush financed his benefit entirely through deficit spending, while Obama had to pay for Obamacare by finding spending cuts and higher taxes. She praises Bush’s program as “popular” and Obama’s as “unpopular,” which is true, largely because Obama had to do the unpopular thing of paying for the benefits he created while Bush did not. The core of Rubin’s defense is that Bush was terrific if you exempt him from any blame for the disasters that occurred during his presidency, and credit him entirely for the non-disaster periods. This sentence is a particular masterpiece: “Unlike Obama’s tenure, there was no successful attack on the homeland after 9/11.” In fact, it is not true — there were small terrorist attacks on the United States, both abroad and at home, after 9/11. But exempting the most disastrous attack on the United States from Bush’s record of avoiding terrorism is a feat of propaganda that, while common, continues to boggle the mind. Emperor Honorius Kept Rome Safe, except that one time it was sacked by the Visigoths. Likewise, Rubin touts “7 1/2 years of job growth and prosperity.” When you’re evaluating a president who served for eight years, you should be suspicious of phrases like “7 ½ years.” Why pick that time frame? Apparently Rubin is chopping off the recession of 2001, which Bush defenders have always, not unfairly, blamed on conditions that preceded him. She is also chopping off the recession of 2008, which is harder to justify given the previous decision. So the claim here is that, between the two recessions that began under Bush, we were not in a recession. But the period between the two recessions was a giant housing bubble. And even if we ignore that fact, absolve Bush for the first recession because it came at the beginning of his term, absolve him for the second recession because it came at the end, and absolve him for the bubble that he did nothing to deflate, the fact remains that the job and income growth during that middle period was extraordinarily and historically weak. If you want to look kindly on Bush’s presidency, you can fairly say that, while he deserves significant blame for ignoring warnings of an Al Qaeda strike and the housing bubble, the disasters of his tenure were not entirely his fault. But what did he do? His economic policies exacerbated income inequality without producing prosperity. His massive increase of the structural budget deficit, which ballooned to over a trillion dollars before President Obama took office, left the United States less fiscally equipped to respond to the economic crisis he also left his predecessor. He initiated a costly war on the basis of both mistaken and deliberately cooked intelligence, and failed to plan for the postwar period. His policies not only ignored the crises of climate change and a costly and cruel health insurance system, but made both much harder to solve. The failures of Bush’s governing method — the staffing of hacks and cronies, the disdain for evidence — was perfectly reflected in the outcomes. The Bush presidency was a full disaster at home and abroad, and whatever small accomplishments that can be salvaged barely rate any mention in comparison with the failures. The general reckoning of Bush is not too harsh. It is too kind.